Habitat: Cucumbertree is a member of the deciduous community and is found at the higher elevations (3,000-4,000 feet) in the Appalachians. It prefers moist soils. Characteristics: Attains a height of 40-70 feet; the trunk having a diameter of 1-3 feet. The leaves are 5-10 inches long and are similar in appearance to the other magnolias. The cucumber-like fruit is green when young and turns red when older; the seeds are bright red. It is the most hardy of the seven tree-sized magnolias native to the United States. Cucumbertree grows singly or in small groups. The wood is light and weak, but it is durable and works easily. It is used for cabinet work, interior finish, boxes, and crates. 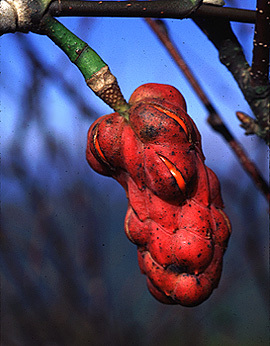 The fleshy, immature fruit looks like a small cucumber. As it matures it turns from green to a purplish-red color. The leaves are quite large -from seven to ten inches long and from four to six inches wide.